Two groups of scientists, using data from NASA's Chandra X-ray Observatory and other telescopes, have found evidence that the growth of the biggest black holes in the Universe is outrunning the rate of formation of stars in the galaxies they inhabit. This would be quite a surprise. Over many years, astronomers have gathered data on the formation of stars in galaxies and the growth of supermassive black holes — that is, those with millions or billions the mass of the Sun — in their centers. These data suggested that the black holes and the stars in their host galaxies grow in tandem with each other. Using large amounts of data from NASA's Chandra X-ray Observatory, the Hubble Space Telescope, the world's biggest radio telescopes, and more, these scientists have reconstructed a race that began billions of years ago. This research leads the astronomers to ask: why? 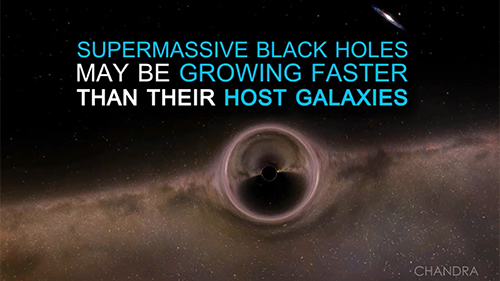 What leads these giant black holes to get a jump on growth over their galactic hosts? Do they simply grow faster or do they have a head start? While these are difficult questions to answer, luckily astronomers have amazing resources like the Chandra Deep Field-South at their disposal. This dataset is the deepest X-ray image ever obtained, representing millions of seconds of Chandra exposure time. This one dataset gives astronomers a window into what black holes were doing billions of years ago. Let's see what new discoveries will come next. Scientists have discovered that supermassive black holes in the centers of galaxies may be growing faster than their host galaxies. This challenges the long-held belief that black holes and their galaxies grow in lockstep. Astronomers used very deep data from NASA's Chandra X-ray Observatory and other telescopes to make this discovery. These data allowed them to peer back billions of years in cosmic history to see how the black holes and galaxies behaved. 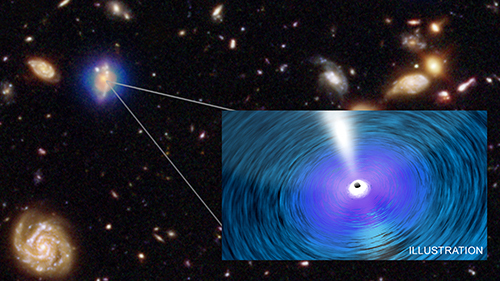 Astronomers are excited to figure out why and how these black holes grew so quickly.